Now that the emotional storm following the American Statistical Association’s statement on p-values is slowing down (is it? was there even a storm outside of the statistics area? ), let’s think about a practical issue. One that greatly influences data analysis in most fields: statistical software. Statistical software influences which methods are used and how they are reported. Software companies thus affect entire disciplines and how they progress and communicate. 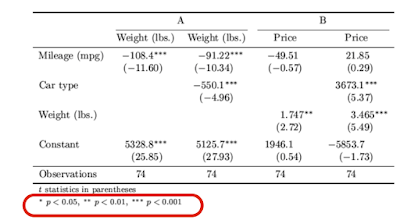 No matter whether your field uses SAS, SPSS (now IBM), STATA, or another statistical software package, you’re likely to have seen the star notation (this isn’t about hotel ratings). 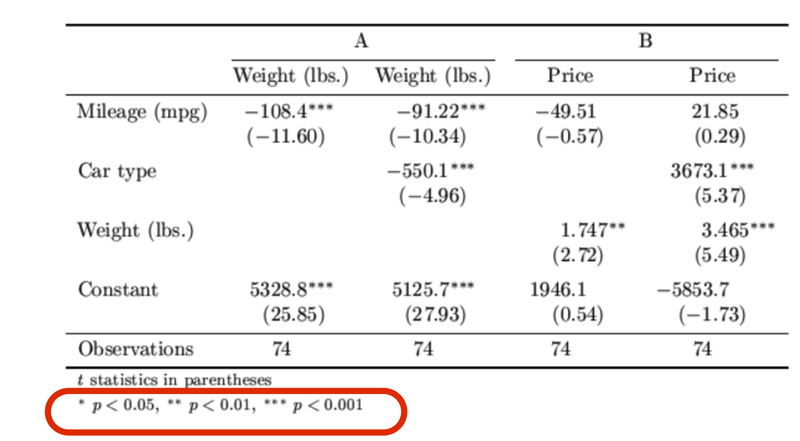 One star (*) means p-value<0.05, two stars (**) mean p-value<0.01, and three stars (***) mean p-value<0.001. This statement is a strong signal to the statistical software companies: continuing to use the star notation, even if your users are addicted to them, is in violation of the ASA recommendation. Will we be seeing any change soon?